On April 25, the United States Supreme Court unanimously ruled tribal sovereign immunity does not protect William Clarke, a limousine driver employed by the Mohegan Tribal Gaming Authority, and remanded the case for further proceedings. While transporting patron from the Mohegan gaming facility, on a Connecticut interstate, Clarke was involved in a car accident with plaintiffs Brian and Michelle Lewis. The Lewis’ sued Clarke in his individual capacity for damages stemming from negligence. Clarke argued sovereign immunity barred the lawsuit because he is a tribal employee who was acting within the scope of his employment and even though the suit is against him individually, the Mohegan Tribe will ultimately pay a judgment against him through indemnification. Sovereign immunity protects federally recognized tribes and tribal entities. The same can be said of their tribal leaders, officers, and employees when sued in their official capacities. In “official capacity” suits the real party in interest is considered the sovereign, who has immunity, and more importantly, any payment of damages in such suits will be from the sovereign’s treasury. Only the tribe itself or Congress can waive sovereign immunity. Such waivers must be express and unequivocal and cannot be implied. The Mohegan Tribe that employed Clarke enjoys sovereign immunity and adopted into its Tribal Code an indemnification provision that “shall save and hold harmless and indemnify its Officer or Employee from financial loss and expense rising out of any claim, demand, or suit by reason of his or her alleged negligence…if the Officer or Employee is found to have been acting in the discharge of his or her duties or within the scope of his or her employment.” The Tribe does not indemnify employees who engage in “wanton, reckless or malicious activity.” Mohegan Tribal Code 4-52. The decision in Lewis v. Clarke is significant in at least two respects. 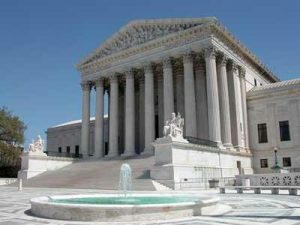 The fact it was unanimous suggests a lack of debate or difference of opinion among the eight justices who participated in the proceedings (recently confirmed Justice Gorsuch did not nor did he take part in the decision), therefore individuals hoping for a different outcome probably won’t see a radical change on this issue any time soon. Moreover, Lewis v. Clarke could also lead to an increase in litigation against tribal leaders, officials, and employees for tortious conduct. Tribes should be proactive in taking steps to protect themselves and their employees from an inevitable legal action in the future. 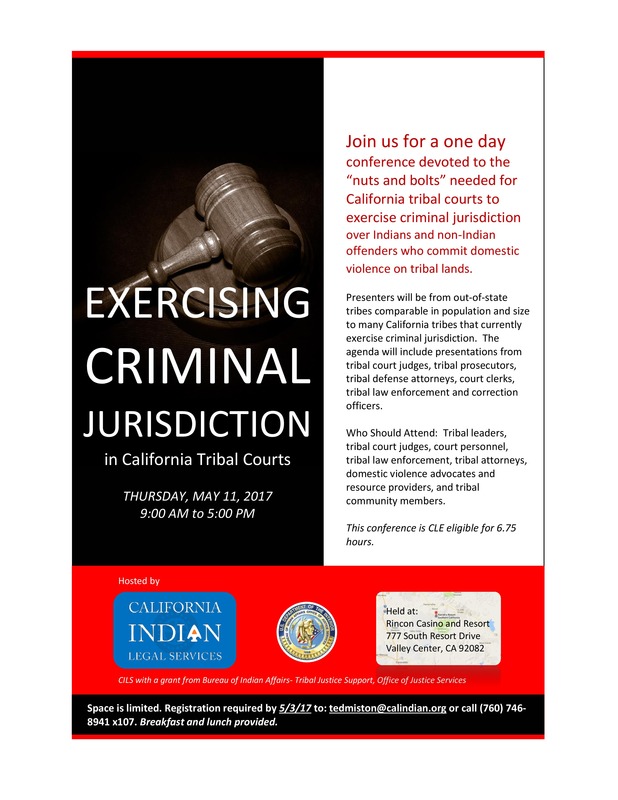 Join us for a one-day conference devoted to the “nuts and bolts” needed for California tribal courts to exercise criminal jurisdiction over Indians and non-Indian offenders who commit domestic violence on tribal lands. Presenters will be from out-of-state tribes comparable in population and size to many California tribes that currently exercise criminal jurisdiction. The agenda will include presentations from tribal court judges, tribal prosecutors, tribal defense attorneys, court clerks, tribal law enforcement and correction officers. Who Should Attend: Tribal leaders, tribal court judges, court personnel, tribal law enforcement, tribal attorneys, domestic violence advocates and resource providers, and tribal community members. This conference is CLE eligible for 6.75 hours. Space is limited. Registration required by 5/3/17 to: tedmiston@calindian.org or call (760) 746-8941 x107. Breakfast and lunch are being provided. Hosted by CILS with a grant from Bureau of Indian Affairs- Tribal Justice Support, Office of Justice Services. 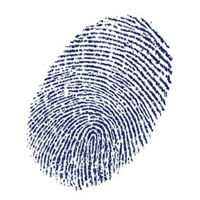  Policies the tribe should consider in operating its criminal background check program. Please submit your questions to TribalCriminalBackgroundcheck@calindian.org. This service is being provided through funding from the California Department of Social Services.